Forbidden or impossible colors are colors your eyes can't perceive because of the way they work. In color theory, the reason you can't see certain colors is because of the opponent process. There is overlap between the wavelengths of light covered by the cone cells, so you see more than just blue, yellow, red, and green. 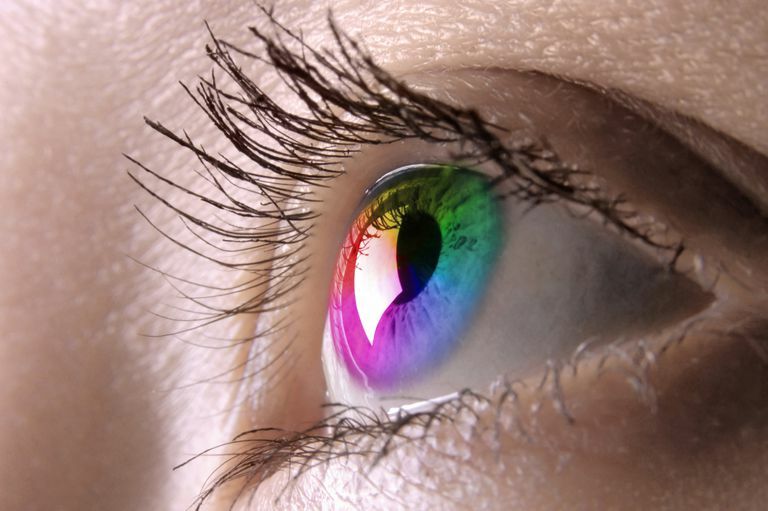 White, for example, is not a wavelength of light, yet the human eye perceives it as a mixture of different spectral colors. Because of the opponent process, you can't see both blue and yellow at the same time, nor red and green. These combinations are so-called impossible colors. While you can't ordinarily see both red and green or both blue and yellow, visual scientist Hewitt Crane and his colleague Thomas Piantanida published a paper in Science claiming such perception was possible. In their 1983 paper "On Seeing Reddish Green and Yellowish Blue" they claimed volunteers viewing adjacent red and green stripes could see reddish green, while viewers of adjacent yellow and blue stripes could see yellowish blue. The researchers used an eye tracker to hold the images in a fixed position relative to the volunteer's eyes so retinal cells were constantly stimulated by the same stripe. For example, one cone might always see either a yellow stripe, while another cone would always see a blue stripe. The volunteers reported the borders between the stripes faded into each other and that the color of the interface was a color they had never seen before — simultaneous red and green or both blue and yellow. A similar phenomenon has been reported in which persons with grapheme color synesthesia. In color synthesthesia, a viewer may see different letters of words as having opposing colors. A red "o" and green "f" of the word "of" may produce reddish green at the edges of the letters. The impossible colors reddish green and yellowish blue are imaginary colors that do not occur in the light spectrum. Another type of imaginary color is a chimerical color. A chimerical color is seen by looking at a color until the cone cells are fatigued and then looking at a different color. This produces an afterimage perceived by the brain, not the eyes. Self-luminous colors: Self-luminous colors appear to glow even though no light is emitted. An example is "self-luminous red," which may be seen by staring at green and then looking at white. When green cones are fatigued, the after-image is red. Looking at white causes the red to appear brighter than white, as if it was glowing. Stygian colors: Stygian colors are dark and supersaturated. For example, "stygian blue" may be seen by staring at bright yellow and then looking at black. The normal afterimage is dark blue. When viewed against black, the resulting blue is as dark as black, yet colored. Stygian colors appear on black because certain neurons only fire signals in the dark. Hyperbolic colors: Hyperbolic colors are supersaturated. A hyperbolic color may be seen by staring at a bright color and then viewing its complementary color. For example, staring at magenta produces a green afterimage. If you stare at magenta and then look at something green, the afterimage is "hyperbolic green." If you stare at bright cyan and then view the orange afterimage on an orange background, you see "hyperbolic orange". Chimerical colors are imaginary colors that are easy to see. Basically, all you need to do is focus on a color for 30-60 seconds and then view the afterimage against white (self luminous), black (stygian), or the complementary color (hyperbolic). To see yellowish blue, cross your eyes to put the two "plus" symbols on top of each other. Impossible colors like reddish green or yellowish blue are trickier to see. To try to see these colors, put a yellow object and blue object right next to each other and cross your eyes so that the two objects overlap. The same procedure works for green and red. The overlapping region may appear to be a mix of the two colors (i.e., green for blue and yellow, brown for red and green), a field of dots of the component colors, or an unfamiliar color that is both red/green or yellow/blue at once! Some researchers maintain the so-called impossible colors yellowish blue and reddish green are really just intermediate colors. A 2006 study conducted by Po-Jang Hsieh and his team at Dartmouth College repeated Crane's 1983 experiment, but supplied a detailed color map. Respondents in this test identified brown (a mixed color) for reddish green. While chimerical colors are well-documented imaginary colors, the possibility of impossible colors remains disputed. Crane, Hewitt D.; Piantanida, Thomas P. (1983). "On Seeing Reddish Green and Yellowish Blue". Science. 221 (4615): 1078–80. Hsieh, P.-J. ; Tse, P. U. (2006). "Illusory color mixing upon perceptual fading and filling-in does not result in "forbidden colors"". Vision Research. 46 (14): 2251–8. What Are Tertiary Colors and Why Do They Matter? Do You Know How to Mix Secondary Colors?